This story has been archived. Some of the information may have changed since first published. Go to one of the Eiffel tower’s restaurants, 58 Tour Eiffel, to see the style and design of a well known Parisian designer. Buy your ticket on line and save yourself a possible one and a half hours waiting in line. On this second visit to the restaurant 58 Tour Eiffel, I want to feel the ambiance of Patrick Jouin‘s design and style as well as enjoy the restaurant’s picnic-in-a-basket lunch. Around Paris, you see the works of Mr. Jouin either on the street with the Velib’ bicycles or the “sanisettes” (public toilets) or in the design of the shoe department at Galeries Lafayette. Renovated in 2009, everything in the two restaurants (the le Jules Verne and 58) of the Eiffel Tower relate to the tower’s structure. I want to pay more attention to the design of 58’s chairs, the menu, the place setting, the lamps, the colors, and the symbols on the tiles and bathroom doors. When you are welcomed into the 58 Tour Eiffel and shown to your table, your brightly colored menu explains the procedure. In sum, you follow the instructions. Your picnic basket contains your cold items; your server delivers your drink and hot main course and your bill once you ask for it. For details visit their site, click on “Discover” , and find answers to their “Service”, “Cuisine”, and “Practical information”, plus videos of the experience. Check the 58Tour Eiffel site for current lunch, dinner and Bastille Day menu prices. The three-course children’s menu includes a cold starter (perhaps ratatouille), pasta (perhaps macaroni with either butter, tomato sauce or parmesan) and a yummy dessert (could be praline and chocolate cake). The children can also order à la carte if they would like hamburger and fries. The adult and child menus are seasonal and change in April and October. The tower’s first coat of paint in 1889 was red iron ocher. You find this contrasting copper color set against the rich chocolate color of the décor in the napkins, on the cover of the menu and on doors. The tiles below the kitchen counter are fish and plants taken from nineteenth century dictionary illustrations – timely for the building of the Eiffel Tower. 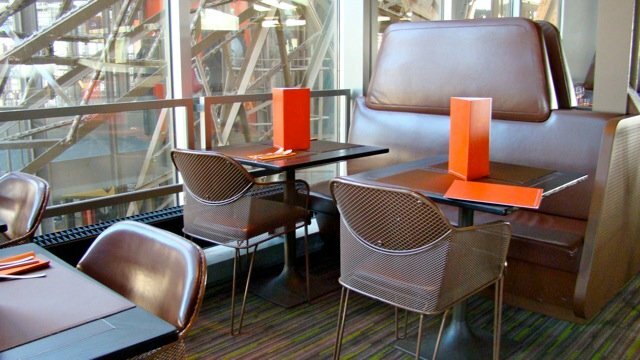 Light travels through the hairnet steel Gustave chairs and through the large windows. This gives the atmosphere of the restaurant a certain lightness that contrasts beautifully with the lightness of the food. The interior design of the 58 is the work of Patrick Jouin (also the Jules Verne restaurant designer) and Pierre Tachon in collaboration with the famous chef, Alain Ducasse. Nothing is left to chance. Weight is very important in the tower; everything must be light. Even the food is prepared below ground; the chickens are emptied, the vegetables washed and peeled. Life at 58Tour Eiffel moves smoothly between the meal times. Lunch is over at 58Tour Eiffel around 5:30 p.m. The ambiance is already changing by 3:30 p.m. One of the waitresses and the maitre’d are conducting the changeover from lunch to dinner. They have been through several restaurant and theme changes over the years on this very floor; when it was “La Belle France”, “Le Parisien”, “Altitude 95”. The music is changing tonight as every night from modern to lounge, the tables are set with wine goblets, the lighting will be subtle enough to avoid reflection on the glass. After lunch, as we are ready to leave, when suddenly I notice my emptied water glass. It has a deep inward projecting curve on the bottom. What part of the tower is represented in this glass? Parts of the tower’s structure run visibly through the restaurant. Our table is located next to the window on the second floor of the 58, with a view directly in front of les Jardins du Trocadéro. I look up and see the beams; I look down at the balustrade and walkway below — but the hints about this glass shape are hidden from view. As we leave the 58 looking for the stairway down, I hear tapping from above. 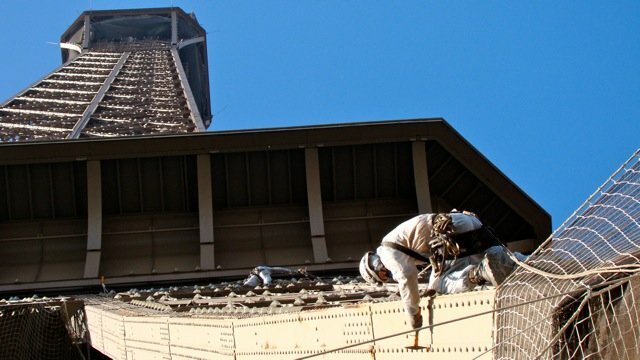 Every seven years, the Eiffel Tower is refurbished, scraped, pounded and painted. Looking up I see four workers attached by ropes to the East pillar of the tower. They are tapping away the rusty spots and the old crusty paint pieces with their multilayer of colors from the past, which are falling to the ground. The sun is shining, I look to the South pillar and there, shining brightly in the sunshine against a cloudless sky are hundreds of curves that resemble the bottom of my water glass. Coincidence or reality? In my mind, I have solved the mystery! When you reserve a dinner at the 58 you receive an email confirmation from the restaurant. For lunch at the 58, you can reserve if you are a group of more than ten adults. They always have room at lunch since it is a buffet system and they can handle up to 250 people between 11:30 a.m. and 4 p.m. Individuals or groups under ten people cannot buy the reduced price tickets or use the special elevator. Speak to the agent in the kiosk on how to proceed to the special elevator entrance marked with flags for the restaurants. Only the restaurant, Jules Verne, has its own elevator. Check their website for the latest twinkling and opening times during different seasons of the year. ← Why Is There July 14 “Bastille Day”? Yes, the 58 Tour Eiffel does have a children’s seasonal lunch menu and a seasonal evening menu. Their video shows a small child with a hamburger and fries; this is an à la carte alternative. Currently, the children’s lunch menu is 13 euros and the dinner menu is 19 euros. 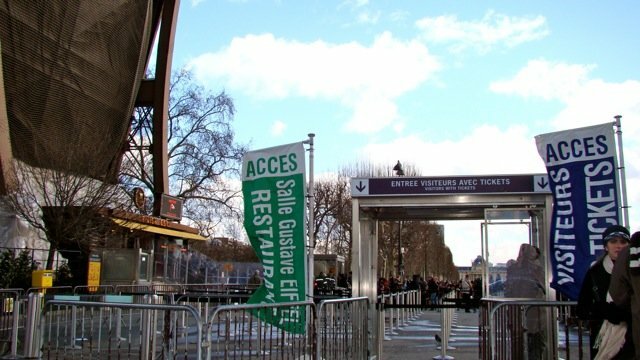 Eiffel Tower-Since March 20 the North leg elevator is closed, emergency alarm malfunction, it slid 15 meters with no alarm sounding, repairs & testing necessary, first time this happens. Only one elevator operating, and the stairs. Plan on a two to three hour waiting line for the one remaining elevator. Originally, expected to be fixed within two weeks – now longer. The remaining elevator can only carry 90 visitors in the up and down rotation. The average number of elevator users is between 13,000 and 14,000 passengers. An average of 25,000 visit the Tower daily. The West leg, closed three years ago for renovation, is scheduled to reopen the end of 2012. You can also use the stairs in the East leg and climb 1,665 stairs to the top or just climb 704 steps to the second level. I am interested in making a dinner reservation at Restaurant 58 and it seems that we still must purchase a ticket to go up to the restaurant or higher. Do you know if we should purchase them online or wait until that day. They have an elevator down currently and wait queues are hours long from what I have read. Obviously I don’t want to have to wait for an hour or more to have dinner . Also, do they have a children’s menu, or one that is priced accordingly for children? Pingback: A Light Beauty Facelift for the Eiffel Tower | Colleen's Paris Blog ! I have dinner reservations at 58 Tour Eiffel in September, but would like to settle this question once and for all: Is the express restaurant line to the public elevator free of charge? Even though you have replied on several occasions that it is free of charge for restaurant patrons with reservations (ie by approaching the kiosk marked “restaurant”), I have read on any number of blogs (both English and French – including 58’s own website) that there will be a charge to go up the first floor (ie where 58 is located) and that you must pay for the tickets that allow you to queue on the express line. In fact, the only point in dispute appears to be whether the lift ticket will be 9 Euros or 4.50 Euros per person. Can you confirm please? My wife and I have reservations for the second seating (9pm) at 58tourEiffel. We wanted to go up to the summit but the online tickets from 6pm to 9pm are sold out. Is it possible to take the restaurant lift several hours before our reservation? If so, can we descend from the summit to the restaurant or do we have to go all the way back down to the base? Pingback: Frequent Eiffel Tower Questions | Colleen's Paris Blog ! Our lunch reservations were confirmed for 24 people and the deposit paid. We went to order our lift tickets on line (2 weeks in advance) and there aren’t any tickets available for that date at any time therefore we stand to lose our deposit. Any suggestions? I have lunch reservations for 58 Tour Eiffel for a party of 25. Do I need to go to the Restaurant Kiosk with the all the guests & check in? Do I purchase tickets at thr kiosk or on-line? I have seen so many discrepancies whether I pay or don’t pay for just dining in the restaurant. Most information is geared towards dinner reservations and no information on the procedures for lunch reservations for a large group. If I make a reservation at 58 Tour for dinner do I need to purchase a lift ticket to get to the restaurant? Can I also explore higher levels either before or after dinner? Do I need to go back down to the ticket office and purchase another ticket to the summit or can I proceed from the restaurant? Hi – I was happy to see that you mention going to the 58 Tour as part of seeing the Tower. I called today and it seemed based on the recording, that they do not take reservations for lunch. Is this true? 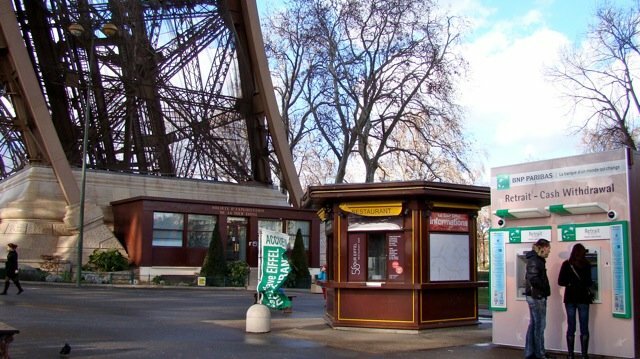 If they do – can I just buy a regular eifel tower ticket online and then proceed to the restaurant line to enter? Hi Alexandra! I have been to the top! Went there yesterday and have now written an article on the subject. You can either buy your ticket to the top at the ticket office (or online) or just buy a ticket to the second level. If you decide then to go up to the summit, a ticket office is on the second level and you can buy your ticket for five euros. Pingback: Pop the cork, it is champagne and iPads at the Eiffel Tower! « Colleen's Paris Blog ! many thanks for Le 58 restaurant article. Have you or someone you know been to the champagne bar at the top? Do you just purchase a ticket to the top? Hi! That is correct. If you are planning on dining at the 58Tour Eiffel, you make a reservation. Tell the person at the kiosk you have a reservation. They will tell you how to proceed to the special elevator entrance.